The FT says that at least two suicide bombers struck at the shrine of medieval Sufi master Datta Ganj Bakhsh (Sayyid Ali Hujwiri), the patron saint of Lahore, on Thursday evening, killing at least 42 and wounding 175. (The death toll will rise since many of the injured are in critical condition). Pakistan’s The News has more details. 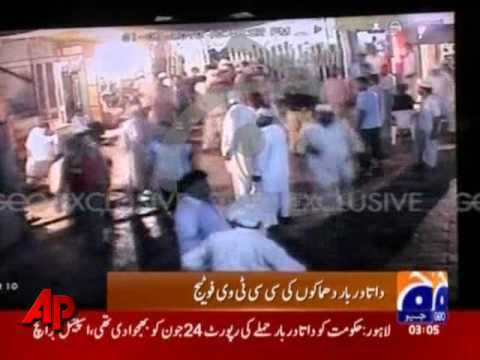 A panic spread in Lahore at other shrines, and the Pakistani government increased security at religious buildings. One Panjabi to whom I spoke predicted that there would be an enormous backlash in Lahore against the Taliban as a result. It is true that such bombings in the eastern, Panjabi city of Lahore, are meant to retaliate for the army’s pushback against Pashtun, Taliban fighters in the northwest. The aim is to spread fear and destabilize the capital of Pakistan’s largest, most influential province. In addition, however, the Taliban have been using terrorism to mark a theological terrain. 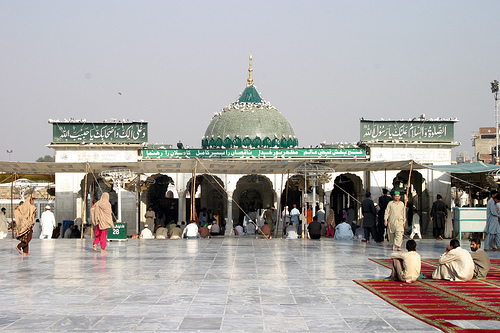 Most Panjabis and Sindhis in Pakistan practice a form of Islam deeply influenced by Sufism, and many visit shrines to obtain the blessings of God through their mediation. In Lahore, malangs or itinerant Sufis, attend melas or religious festivals at shrines like the one attacked. There, qawwali or Muslim spirituals, are sung to the accompaniment of drums. In late December and again in February, the Taliban bombed Shiite Muslim religious processions. In May they struck at a mosque belonging to the Ahmadi sect. And on Thursday they attacked a Sufi shrine. Each of these forms of Islam is considered heretical and even to have departed from Islam by the Taliban, who adhere to a radical branch of the Deobandi movement that has been deeply influenced by the Wahhabism of Saudi Arabia. Wahhabism forbids music and attendance at saints’ shrines. Deobandis, named after the town in which a reformist seminary or madrasah arose in the 19th century, stressed studying and emulating the sayings and doings of the Prophet Muhammad and his early companions. This approach was their way of trying to achieve a purer form of Islam in the Indian subcontinent under British colonial rule, where many Muslims were influenced by Hindu ideas and practices or by British ones. But Deobandi leaders were in the nineteenth and twentieth century themselves adherents of Islamic mysticism or Sufism, a form of Islam that stressed the quest of the believer for union with the divine beloved, God. When Deobandi seminaries came to form the front line of the anti-Soviet struggle in northwest Pakistan in the 1980s, they attracted funding from Saudi Arabia and came under the influence of the Saudi national sect of Islam, Wahhabism. Begun in the 18th century by Muhammad ibn Abdul Wahhab, Wahhabism was from the beginning highly hostile to Shiism and to Sufism, both of which it considered heretical. Wahhabis are the militant Protestants of Islam. The sect predominates in Saudi Arabia, and has few adherents elsewhere in the Muslim world, though Saudi oil money allows the kingdom to spread it elsewhere. Among the targets of Saudi missionaries and officials are Sufi shrines, and they attempt to convince other Muslim governments to close them down. It would be sort of like Calvinist Protestants from Geneva gaining influence over religious policy in Mexico and trying to stop people from visiting the shrines of saints. Note that there are only about 22 million Saudis, by no means all of whom are Wahhabis (12 percent are Shiites). There are 1.5 billion Muslims. So the Saudi form of Islam is very much a minority taste among Muslims. And note that although Wahhabism tends to be practiced in a narrow-minded way and has often disadvantaged Shiites and others, there is no evidence for Wahhabis being more often terrorists than adherents of other forms of Islam. The targeting of religious buildings and processions by the Taliban in Pakistan during the past more than six months, then, signals not only a determination to destabilize the country but also a conviction that Pakistan has departed from the true, pure Islam and that its heretics deserve condign punishment. These Taliban are underlining their faithfulness to the rigid theological ideas of the Wahhabis as the neo-Deobandis interpret them–though contemporary Wahhabi clerical authorities in Saudi Arabia forbid such suicide bombings. The shrine of Datta Ganj Bakhsh is that of the medieval Sufi master Sayyid Ali al-Hujwiri (d. 1072), who traveled widely in Iraq, Iran, Afghanistan and what is now Pakistan, settling in Lahore. Fans of Sayyid Ali Hujwiri put up a facebook page for him here.